We’d written about the IRB Invit, the Infrastructure Investment Trust by IRB Infra. 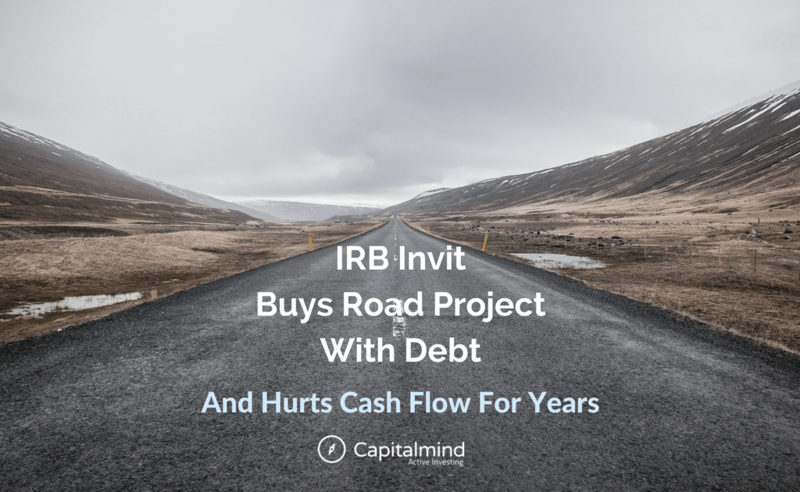 (Read premium post) IRB Infrastructure had a long list of Road Projects but with little cash flow to show for it. As on March 31 2015, it had a negative free cash flow of 27,800 Crores and Debt of 15,000 Crores. With interest eating up 42% of its earnings, clearly this was unsustainable going into the future. In 2014, SEBI published Guidelines for Establishment and Selling of Units by Infrastructure Investment Trusts. The idea is to pool projects into a single vehicle (an InvIT trust) and sell shares of that trust to high-networth and institutional investors, who then get the remaining cash flows. In other words, the Unit Holders will become the owners of the assets that the trust buys. Since Infrastructure assets go back to the government once the concession period is over, the Trust needs to not just generate a return on investment but also be able to return as much of capital as possible before it runs out of time. IRB’s infra InvIT looked interesting but with pre-tax yields at about 9% and with a heavy risk of toll collection or court action, we thought it wasn’t that interesting. The IPO at Rs. 102 per share was oversubscribed by 8.5 times when it closed and yet it never closed above the issue price since it listed. Recently, SEBI allowed Investment Trusts to borrow debt to buy assets. So IRB Invit will now buy another project from the parent, IRB Infra, by borrowing money. Debt can be good if return on the asset is high and the opportunity big. But in this case, that doesn’t seem to be true. Let’s check it out. 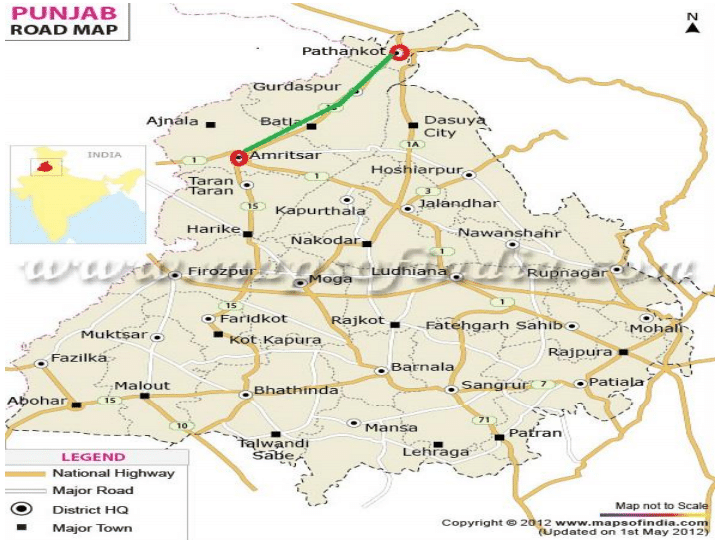 IRB Infra will sell its Amritsar – Pathankot project to IRB InvIT for Rs 1,550 Cr. This will reduce IRB Infra’s debt by Rs 920 Cr – that much of loans will be repaid. The rest comes to IRB Infra as cash. The project is of 102.42 Kms and has a concession of 20 years. The concession started in the year, Dec 31, 2010 and will be ending on Dec 30, 2030. The project was constructed at a cost of Rs 1,445 Crs. The BOT (Build Operate Transfer) contributes 2% of the IRBs consolidated total income in FY17. The BOT has debt of Rs 920 Cr on its book, out of which 700 Cr is senior long term debt (rated BBB) and rest is USD external commercial borrowing. The enterprise value of the project is pegged at Rs 1785.73 Crs, with Rs 319.9 Crs as equity value by Independent valuators. IRB InvIT will be funding the deal by the way of external borrowing of a max of Rs 1,750 Crs. IRB has a rating of BBB and its cost of funds comes to 12%. With the project being transferred to IRB InvIT (which is AAA rated) the interest rates are probably coming down. With an AAA rating IRB InvIT can take a loan at cheaper interest rate somewhere in the range of 7-8%. Post the launch of IRB InvIT, the heavily overburdened IRB Infra has had relief. As on March 31 2017, the net debt of IRB was at Rs 15,150 Cr. The firm nearly paid Rs 1,333 Crs as finance cost for FY17. Post the transfer of assets to IRB InvIT, the net debt had come down to Rs 9,720 Cr. With the current transfer of this project to IRB InvIT, debt will reduce further. Net Debt of IRB may be roughly in the range of Rs 8,100 to Rs 8,300 Cr. For the current year the finance cost might further come down, improving its PBT margins. Debt has reduced by 45% from the peak of Rs 15,000 Crs. The reduction of Debt gives IRB more space for fresh borrowing and can help it to bid for more projects in future. A lower debt in the company will also lead to a better credit rating. Currently IRB is rated at BBB, any upgradation in its rating will help to lower its interest rate on debt by nearly 1-1.5%. As on Mar 31, 2017 IRB’s average cost of debt was at 10.25%. The Amritsar – Pathankot was contributing roughly Rs 120 Cr as revenue to the IRB. Now with the transfer of the asset to IRB InvIT this cash flow will be lost. Considering its debt, finance cost, maintenance and other expenses the project made a net loss of Rs 28.83 Crs to IRB.for FY17. This loss was to the tune of Rs 41.6 Crs in FY16. That much of a loss is no longer IRB’s problem. The cash on books of IRB post the IRB InvIT IPO increased from Rs 1,549 Crs on Mar 31st 2017 to Rs 3,230. Cr as on May 30, 2017. This will further rise to 3,860 Crs post the sale of Amritsar-Pathankot BOT project. At the end of the Q1FY17 IRB had Rs 8,900 Cr order book, which included three projects yet to be started and 2 projects on the verge of completion. The firm further is eyeing to get hold of 200-300 Km projects in current year (roughly translates to an order book of Rs 2,500 – 3,000 Cr). IRB have more room to raise debt and have enough cash in their banks to go for more projects. In totality, this is a positive move for IRB as the company continues to reduce overall indebtedness and net leverage. With major competitors on the throes of bankruptcy, margins going forward should be better. Now to the InvIT: How Does It Pay? IRB Invit Trust is buying this asset by not selling more units (which would mean dilution for existing holders) but by adding debt. Since debt is cheaper for IRB Invit versus IRB, this is supposed to work out better for the unit holders. Or does it really? Let’s assume IRB Invit borrows the required money (Rs. 1550 cr.) at 8%, for a 20 year bond. 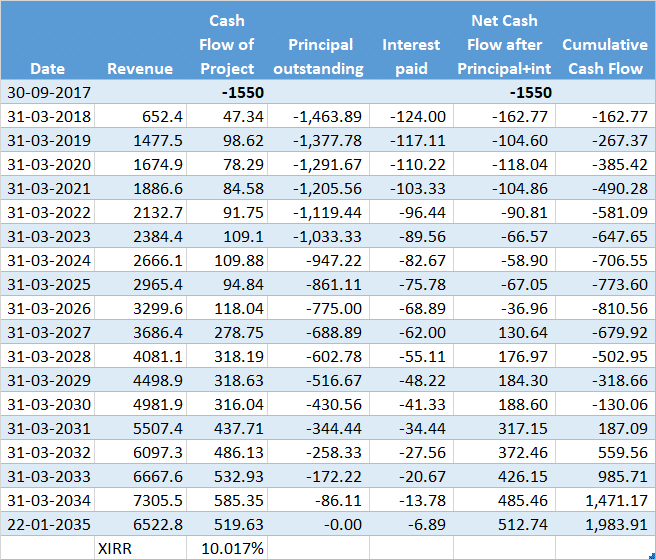 Here is a table showcasing how the cash flow will impact IRB Invit over the period of concession. We are assuming that the amount that is being borrowed will be returned back in equal instalments over the entire period of time. The “XIRR” of this cash flow is extremely nice – at over 10%. But if you notice closely, in the first year, the interest paid is Rs. 124 cr. Which is much higher than the cash flow of the project at Rs. 47 cr. That’s true for year two as well. Assuming an equal principal repayment every year of Rs. 86 cr. the project has net negative cash flows for the next nine years! What this means is: for the first nine years, since this project purchase is funded via debt, the distributable surplus of IRB Invit from all its project will FALL. Other projects generate cash flow, but the interest payments on this project will eat up the returns for the first nine years. So you will get a lower dividend/interest payoff each year. Traffic Projections for the entire period is really shooting in the air. You may be able to estimate for five years. 10 years can be taken with a little bit of salt. But beyond 10 years, the estimates are just numbers plucked from the air. There is just no clue about whether they could be alternative roads by then, or if there’s a major tech change. If everything works out as expected, the Internal Rate of Return on the Project would be close to 12%, a pittance for the kind of risk it requires to be taken. Effectively, this kind of investment makes sense to only long term institutional investors who don’t mind the lower cash flow in the next few years, to enjoy returns in the final years. But if you thought this was a project that would do wonders for the payout at IRB InvIT, we think you would be mistaken, at least for the first nine years. And if you’re happy to predict 2030 earnings, there are many people waiting to sell you bridges.